This version of the popular Mexican snack is lower in fat and packed full of vitamins. Vary the heat with your choice of salsa. They also make fast lunches or suppers. Place the pre-sliced mushrooms on a cutting board and cut slices crosswise into narrow strips. Put the oil in the skillet and place on stove or BBQ burner over medium-high heat. Add mushrooms and carrot; cook and stir constantly with large heatproof spoon for 3-4 minutes or until lightly browned. Reduce heat to medium and stir in salsa and water. Cover the skillet; lower heat to medium and cook about 4 –5 minutes or until vegetables are tender. Carefully remove lid with oven mitts, and continue to cook mixture a few minutes until excess liquid has evaporated and mixture is thick. Turn off heat. While mixture is cooking tear lettuce into bite size pieces or cut into strips with scissors. 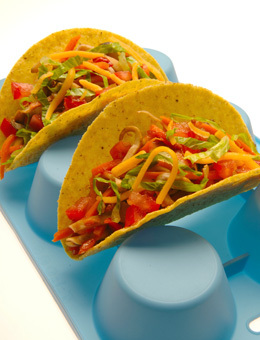 Spoon about 3 tbsp (45 mL) filling into taco shells; top with lettuce and optional garnishes if you like. Variations: Substitute salsa with corn and beans for regular salsa to add extra vitamins and fibre.